Donor Advised Funds (DAFs) have become the most sought-after way for individuals and corporations to manage and achieve their philanthropic goals. 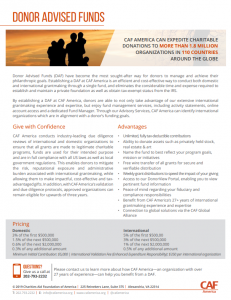 Establishing a DAF at CAF America is an efficient and cost-effective way to conduct both domestic and international grantmaking through a single fund, and eliminates the considerable time and expense required to establish and maintain a private foundation as well as obtain tax-exempt status from the IRS. By establishing a DAF at CAF America, you are able to not only take advantage of our extensive international grantmaking experience and expertise, but enjoy fund management services, including activity statements, online account access and a dedicated Fund Manager. Through our Advisory Services, CAF America can identify international organizations which are in alignment with a donor’s funding goals. CAF America conducts industry-leading due diligence reviews of international and domestic organizations to ensure that all grants are made to legitimate charitable programs, funds are used for their intended purpose and are in full compliance with all US laws as well as local government regulations. 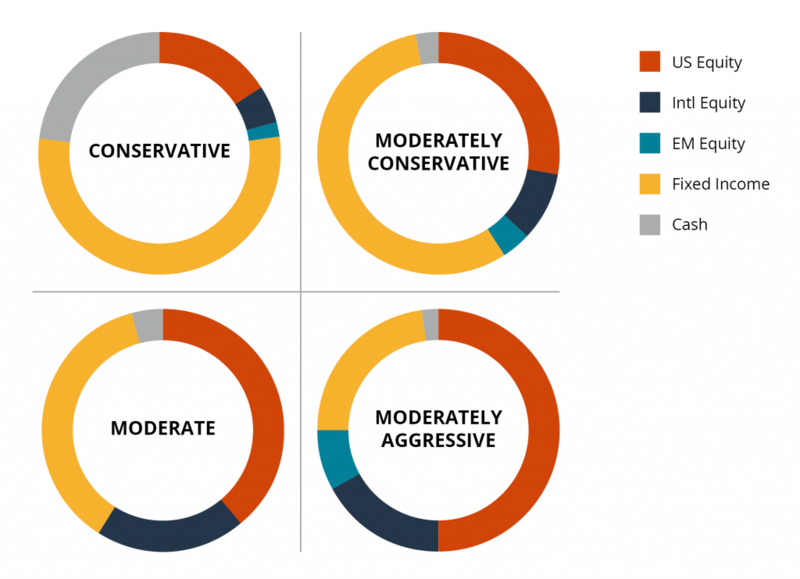 This enables donors to mitigate the risk, reputational exposure and administrative burden associated with international grantmaking, while allowing them to make impactful, cost-effective and tax-advantaged gifts. In addition, with CAF America’s validation and due diligence protocols, approved organizations remain eligible for upwards of three years. For donors wishing to grow the impact of their contributions over time, CAF America offers the option of establishing an Invested Donor Advised Fund (IDAF). With an IDAF, you may recommend investment allocations based on your appetite for risk and goals for growth. 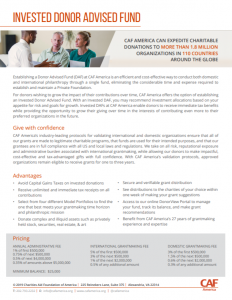 Invested DAFs at CAF America enable donors to receive immediate tax benefits while providing the opportunity to grow their giving over time in the interests of contributing even more to their preferred organizations in the future.